ITER Director-General Osamu Motojima and the Head of the Korean Domestic Agency, Kijung Jung, signing the Procurement Arrangement in the presence of GS Lee, president of the National Fusion Research Institute of Korea and staff members. Last week, the first Procurement Arrangement for ITER's Diagnostic Division was signed by ITER Director-General Osamu Motojima and the Head of the Korean Domestic Agency, Kijung Jung. Procurement Arrangement 5.5P1.KO.01 covers the neutron activation system, a technology to measure actual fusion power, and the vacuum ultra violet (VUV) edge imaging spectrometer, which measures the impurities in the ITER plasma. The signature—a symbolic step forward to the challenging journey of ITER diagnostics—took place in a quiet side event during the recent ITER Council meeting in Aomori, Japan. A sketch of the Neutron Activation System that will measure ITER's power output. There will be six different technologies installed in and around the ITER machine to measure the neutron emission and ultimately the absolute fusion power generated. One of them is the neutron activation system that relies on a pneumatic transfer system through which small capsules containing different metals such as aluminium, iron, niobium or tungsten are brought close to the plasma. The system works very much like the pneumatic tube delivery systems found in pharmacies or big libraries. Stored in a transfer station in the Tokamak Building, the capsules are sent off to the vacuum vessel via a system of bended, double pipes made out of ITER-grade stainless steel, a material which can withstand temperatures up to 800 °C. The tubes are connected to the vessel by feed-throughs between the shielding blankets. Once the capsules have arrived, a pneumatic flap closes the tube and stops the target for 10 seconds. During this time the neutrons escaping the plasma do their work (i.e., they hit the target which becomes radioactive). The flap is then opened again and the target catapulted back to a counting station where the neutron induced γ-ray activity is measured. The fusion power is estimated by taking into account the nuclear properties of the target materials and the measured gamma activity. The team that paved the way to the signature: Michael Walsh, Robin Barnsley, Daniela Puttmann, Mike Minihane, H.G. Lee, and Luciano Bertalot. Neutron activation systems (NAS) have delivered reliable results on various existing tokamaks such as TFTR or JET. 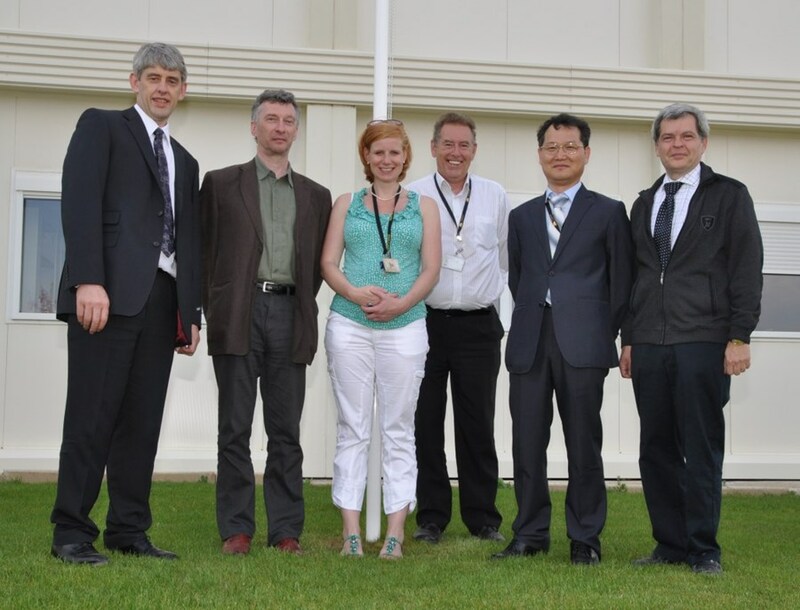 "The system installed at JET was our reference design," explains Luciano Bertalot from the ITER Diagnostics Division, "which, together with our Korean colleagues, we developed further to adapt to the hotter and harsher conditions on ITER." The improved design is currently being tested on the Korean tokamak KSTAR. And it will be Korea that will ultimately build the NAS system for ITER. "The Korean Domestic Agency, with full responsibility and in close collaboration with the ITER Organization, will do its best to implement the NAS system and to have it built for the fusion power measurement on ITER," said H.G. Lee, on behalf of ITER Korea. A detailed article explaining the second diagnostic technique covered under this Procurement Arrangment—VUV edge imaging dpectrometry—will follow in next week's edition of ITER Newsline.